As a young boy Setanta was told many stories about his uncle King Conor Mac Nessa, His Kingdom at Emhain Macha and the famous Macra. The Macra was set up by King Conor Mac Nessa and was training school for young boys to become future knights and leaders of the king’s army. The boys were trained every day to use weapons, they practiced wrestling and challenged each other to contests and games especially Hurling as this was regarded as a game of great skill and speed. Setanta longed to become a member of the Macra and at aged nine set out with determination from his home on the Cooley Mountains for Emhain Macha. On his back he carried a bag of deerskin and in his hand he carried items to shorten his journey, a hurley said to be made out of brass, a sliotar made out of silver, a spear and a javelin. Along the journey he would strike the sliotar with the hurl as hard as he could then throw the hurl, then the spear and then the javelin into the air after the sliotar and run to catch all four in succession without letting them hitting the ground. As Setanta arrived at Emhain Macha the boys of the Macra were playing hurling as King Conor looked on. Setanta rushed in uninvited to play, he beat every boy to the sliotar and dribbled, pucked and carried it on his hurl the length of the playing pitch and drove it unstoppably into the goal. In a fit of anger at the intrusion the boys charged at Setanta with their hurleys but he warded them all off, single handedly! The king, not recognizing his young nephew, intervened and demanded to know who Setanta was and what he was playing at? Setanta told his uncle who he was. King Conor was delighted and commented that if Setanta was half as good a warrior as he was a hurler then he would be a rare catch! Setanta’s dream came true when King Conor invited him to become a member of The Macra. Shortly after joining the Macra Setanta was playing hurling when King Conor was passing on his way to a feast at the house of his blacksmith Culann. He stopped to look at the boys playing and noticed that it was two teams playing as normal except that Setanta was playing on his own against the two teams. As a reward Conor invited Setanta to the feast, however Setanta explained that he couldn’t leave just yet as the game wasn’t finished. It was agreed that Setanta would follow Conor to Culann’s House after the game. Culann rushed outside and were amazed to see Setanta alive and the hound dead. King Conor was delighted to see his nephew alive and well however Culann was upset that his mighty watchdog was dead. Seeing Culann’s distress at the loss of his hound Setanta offered Culann a deal. If Culann found another young dog Setanta would train the dog to be as magnificent as the one he had killed. In the meantime Setanta himself would defend Culann’s forth and be Culann’s watchdog. 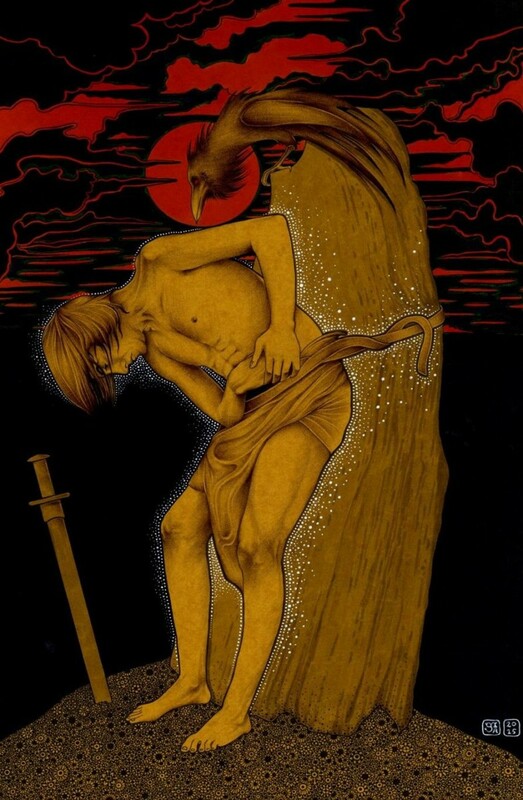 Culann accepted this offer Setanta was given the new name of Cú Chulainn, the hound (cú) of Culann. Eventually Setanta completed his promise to Culann but was known as Cú Chulainn until the day he died. the Dun Cow, the 12th Century Book of Leinster and the 14th century Book of Lecan. Despite this historians, folklorists and archaeologists believe that the Táin is set is The Irish Iron Age. The Irish Iron Age dates from 500BC to 500AD and is characterized by the use of Iron for weapons and tools. The people who lived in Ireland at the time were known as the Celts and lived a farming clan-based lifestyle. Not only has the Táin provided us with one of Ireland’s greatest heroes and hurler but also provides us with the evidence to date hurling to the Irish Iron Age. As a young boy Setanta was told many stories about his uncle King Conor Mac Nessa, his Kingdom at Emhain Macha and the famous Macra. The Macra was set up by King Conor and was a training school for young boys to become future warriors in the king’s army. The Macra trained every day to use weapons and challenged each other to games especially hurling as it was regarded as a game of great skill and speed. Setanta longed to become a member of the Macra and at aged nine he set out with determination from his home on the Cooley Mountains for Emhain Macha. In his hands he carried items to shorten his journey, a hurley made out of brass, a sliotar made out of silver and a spear. Along the journey he would strike the silver sliotar with the brass hurl as hard as he could then throw the hurl and then the spear into the air after the sliotar and run to catch all three in succession without letting them hit the ground. As Setanta arrived at Emhain Macha the boys of the Macra were playing hurling as King Conor looked on. Setanta rushed in to play, he beat every boy to the sliotar then dribbled, pucked and carried it on his hurl the length of the playing pitch and finally hit it unstoppably into the goal. In a fit of anger at the intrusion, the boys charged at Setanta with their hurleys but he fought them all off, single-handedly! The king, not recognising his young nephew, intervened and demanded to know who Setanta was? Setanta explained his story. King Conor was delighted to meet his nephew and remarked that if Setanta was half as good a warrior as he was a hurler then he would be a rare catch! Setanta’s dream came true when King Conor invited him to become a member of the Macra. Shortly after joining the Macra Setanta was playing hurling when King Conor was passing on his way to a feast at the house of his blacksmith, Culann. He stopped to watch the boys playing and noticed that it was two teams playing as normal except that Setanta was playing on his own against the two teams! As a reward Conor invited Setanta to the feast, however Setanta explained that he couldn’t leave just yet as the game wasn’t finished. It was agreed that Setanta would follow Conor to Culann’s house after the game. Setanta offered Culann a deal. If Culann found another young dog Setanta would train the dog to be as magnificent as the one he had killed. In the meantime Setanta himself would defend Culann’s fort and be Culann’s watchdog. Culann happily accepted this offer and Setanta was given the new name of Cú Chulainn, the hound (cú) of Culann. Eventually Setanta completed his promise to Culann but was known as Cú Chulainn until the day he died.